1) This paper was presented at the FIG Working Week 2017 in Helsinki, Finland, 29 May – 2 June. Ghost driver incidents become a major concern for every individual road user. In order to enhance road safety, particularly by entering and exiting an autobahn, a telematics system for preventing ghost driver incidents will be implemented within the research project Ghosthunter. This study aims to investigate the use potential of digital road maps for preparation and development of an intelligent wrong-way driving detection system. Digital road maps that are navigable and contain detailed traffic-specific and environmental information like the lane curvature or the lane width contribute significantly to improving the performance and the reliability of many advanced driver assistance and safety systems. In the last two decades, both the quality assessment of various digital road map data and the development of novel map matching technologies are becoming increasingly important and popular issues, particularly for safety-critical applications, such as control system of automobiles, trains or ships. With the rapid development of digital road maps over the years, current quality-assured digital road map data can be provided with required accuracy and level of details. For the purpose of the wrong-way driving detection on the German autobahn of the research project Ghosthunter, which is operated in cooperation with the University of the Federal Armed Forces Munich (UniBwM) and the company NavCert from Braunschweig, a valid, reliable and comprehensive quality assessment of digital road maps from four different data providers (two commercial mapmakers: HERE and TomTom; the volunteered geographic information: OpenStreetMap data; the German official topographic-cartographic information system: ATKIS-Basis-DLM) is performed with proposed quality criteria in this work. It aims to investigate the use potential of these digital road maps for preparation and development of an intelligent wrong-way driving detection system. The quality criteria utilized for evaluation of geometric accuracy (absolute and relative positional accuracy) of the map data are presented in this work. Moreover the attribute completeness of each dataset is compared and discussed with prominent examples. The results show that the map data which have been analyzed can provide completely the level of accuracy specified in the current literature. The investigated map data have achieved 2 m RMS absolute positional accuracy and 1 m RMS relative positional accuracy. It can also be demonstrated that HERE and TomTom have a higher completeness of traffic-related attributes, particularly the travel direction and the number of lanes, and hence are more compliant with road safety applications than OpenStreetMap and ATKIS-Basis-DLM. In recent times, ghost driver incidents become a major concern for every individual road user. A ghost driver is an individual who travels in a wrong direction or completely against traffic flow. Every year there are almost 2,000 ghost drivers that are responsible for approximately 80 accidents and 20 fatalities on German autobahn (BU-Wuppertal, 2012 and ADAC, 2010). In order to enhance road safety, particularly by entering and exiting an autobahn, a telematics system for preventing ghost driver incidents will be implemented within the research project Ghosthunter in cooperation with the University of the Federal Armed Forces Munich (UniBwM) and the company NavCert from Braunschweig. This project covers the development of a robust (D)GNSS-based real-time algorithm for recording accurate vehicle trajectory data and various types of map matching algorithms for estimating continuous and reliable vehicle location on the identified road segment. Before designing and developing map matching algorithms, the first major task of the Institute of Engineering Geodesy (IIGS) at the University of Stuttgart in the project Ghosthunter is a valid, reliable and comprehensive quality assessment of digital road maps of four different data providers, amongst which HERE and TomTom are commercial geodata and the OpenStreetMap (OSM) data is available for free to users, while the Amtliches Topographisch-Kartographisches Informationssystem (ATKIS), known as the German official topographic-cartographic information system, might provide spatial map data of the highest quality. The short paper is organized as follows: First previous studies related to the evaluation of map accuracy assessment are presented. Then the generated reference trajectory based on GNSS and the quality criteria are described. Finally the assessment results and the main conclusion are discussed. Digital road maps that are navigable and contain detailed traffic-specific information like the lane curvature or the lane width (ADV, 2010) help to improve the performance and reliability of many intelligent navigation systems and become increasingly popular and useful for road safety applications. With the growing interest in quality evaluations of digital road network data, many efforts have been made and a variety of research methods has been applied to study map accuracy. Goodchild and Hunter (1997) developed a simple probabilistic method to estimate the positional accuracy for geospatial line elements in 1997 applying a buffer polygon of a defined width along the reference track. After this early attempt, Helbich et al. (2012) made a statistical comparison between OSM, TomTom and reference data for a well-mapped German city concerning positional error of junction points using bidimensional regression and concluded that both OSM and TomTom had a spatial accuracy within 5-6 meters. Despite the above mentioned investigations, a research on OSM’s evolution during the years of 2007-2011 is described in Neis et al. (2012), which deals with the changes in data completeness and topological accuracy of the OSM road network covering the whole of Germany. These preliminary studies show that the digital map quality has obviously improved in recent years due to the rapid technological progress and a growing number of users. In this paper an efficient and practical method of determining data accuracy for digital road maps based on well-founded criteria in terms of absolute positional error and form deviation compared to reference location is proposed. A quality assessment of spatial road network data in well-chosen map areas (typical autobahn junctions in Stuttgart, which is the capital of Baden-Württemberg, Germany) is presented, including illustration and analysis of the results. For the evaluation of absolute positional and shape accuracy of road segments in the given digital maps and hence the comparison of map quality between commercial, official and free datasets, precise kinematic reference trajectories based on differential carrier-phase GNSS positioning were generated using a high-end geodetic GNSS two-frequency receiver (Leica Viva GS15) mounted on a land vehicle with CS15 field controller. The final coordinates of the kinematic GNSS tracks in the Universal Transverse Mercator (UTM) system with accuracies better than 10 cm were computed by a specialized GNSS baseline processing software, named Wa2 (Wa2, 2015), which provides a reliable and precise offline solution as well as a detailed output protocol. In this work, the investigations of the quality of the spatial road network data carried out in this paper were concentrated in entrance and exit areas on the German autobahn close to Stuttgart, while eight exemplary autobahn junctions with different geometric designs along the state highway A81 near Stuttgart (Germany) including eighteen autobahn entrances and seventeen autobahn exits are considered for the quality evaluation in Section IV. Figure 1 illustrates one example of the investigated region, which is a typical cloverleaf interchange with two entrances and two exits on each side of the autobahn. As shown in Figure 2, the UTM coordinates of the measured points based on high-rate (1 Hz) kinematic GNSS observations and the road locations in HERE Maps match apparently very well. Nevertheless the geometric map data to be assessed (HERE, TomTom, OSM and ATKIS-Basis-DLM) may differ from each other due to the fact that the road networks from various providers are probably acquired using different methods. Maps date in comparison to GNSS-based trajectories. In order to achieve more realistic assessment results, the shortest distance between the GNSS point and the circular arc determined from three shape points of the identified edge in the digital map has been used to describe the absolute positional accuracy instead of those from the GNSS point to the identified edge itself, since the shapes of actual roads, especially at the autobahn junctions, are mostly neither straight nor polygonal, but rather smoothly curved. 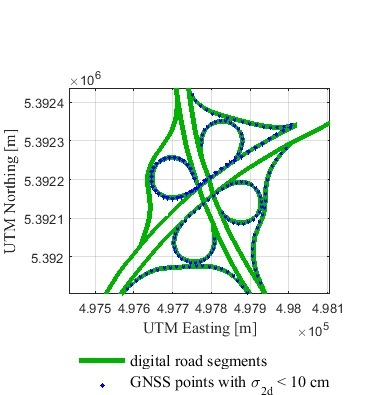 where i is the number of shape points varying from 1 to n and and denote UTM easting and UTM northing of the foot of perpendicular from each GNSS point to the correctly identified road link, respectively. at the GNSS points that are derived from the reference trajectory comparing to the homologous nodes or shape points of linear features in the digital map. Here the RMS values of ∆∆α and ∆κ are calculated according to the equations (6) and (8). To allow for an easier and better comparison for relative accuracy in respect to rms∆∆α , degrees to meters conversion has been computed with a factor Dl of 13 meters in (6), which equals about the average distance between two continuous GNSS points. The converted RMS values are denoted by the symbol rms∆∆α* (see Table 1). Taking advantage of the above described criteria, the absolute and relative positional accuracy of digital road network data to be investigated in this work can be calculated efficiently. Furthermore, the completeness of attributes which provide essential information for routing applications and road safety, such as the direction of traffic flow and the number of lanes, should be considered (HERE, 2015 and TomTom, 2014). The achieved absolute and relative positional ac-curacies of the spatial roads database HERE, TomTom, OSM and ATKIS-Basis-DLM are given in Table 1. From the accuracy assessment results, it can be seen that the final average RMS values of absolute position error of all the four datasets are around 2 meters, while the differences between these RMS values are small: maximum 0.22 meter. In terms of the relative positional accuracy, the average RMS values of difference of orientation changes ∆∆a and curvature difference ∆k vary from 4.1° to 5.1° and from 5.3 km-1 to 8.7 km-1, respectively. Tab. 1: Comparison of absolute an relative positional accuracy between HERE, TomTom, OSM and ATKIS-Basis DLM. On the other hand, the positional accuracies in the table above, which are based on our criteria, should be verified by comparing them to the accuracy specifications in the literature. As reported in AdV (2010), HERE (2015) and (TomTom, 2014), both HERE and TomTom data that are in compliance with ADAS (Advanced Driver Assistance Systems) can reach an absolute positional accuracy better than 5 meters and a relative positional accuracy better than 1 meter, ATKIS-Basis-DLM has an geometric accuracy of 3 meters, however, for the crowdsourced OSM no available information about data accuracy have been found. Obviously, the four datasets of spatial road net-work data are within the absolute accuracy values specified in the literature, while the relative positional error of TomTom and ATKIS has slightly exceeded 1 meter. It has to be mentioned that there are also road data with lower levels of positional accuracy that do not fulfil the ADAS requirement. The results of accuracy assessment of such comparably inaccurate road segments based on only one autobahn entrance and two autobahn exit ramps show that the absolute positional accuracy is about 4 meters, while the level of the relative positional accuracy remains at around 1 meter. In addition to positional accuracy, attribute completeness of geographic data is also one of the main quality elements of our investigation (Wiltschko & Kaufmann, 2005). Table 2 summarizes several relevant attributes for vehicle telematics applications (such as routing and navigation) that are contained in our spatial databases: Here, TomTom, OSM and ATKIS-Basis-DLM, respectively. Although OSM and ATKIS, as shown in the table below, lack the attribute of travel direction, the disadvantage has been compensated by our own acquired information. In this paper a detailed assessment of geometric accuracy and attribute completeness for four different spatial road network datasets that cover commercial, official and free data source has been performed. 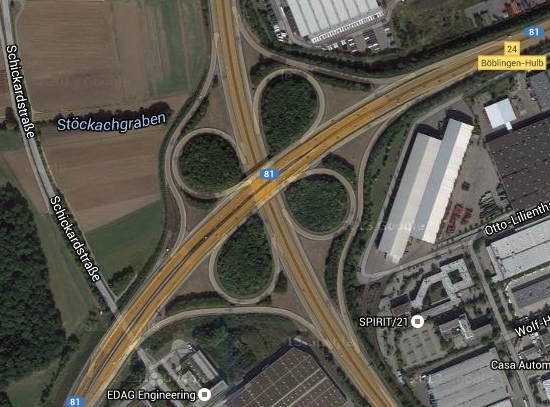 With the focus on the autobahn entrance and exit, our proposed evaluation approach based on high-precision GNSS trajectories was implemented successfully. The investigated map data products have achieved a higher level of accuracy than specified in literature: an absolute positional accuracy of 2 meters and a relative positional accuracy of 1 meter. The difference of the accuracy values for the four datasets differ only slightly and is based on a sample of limited size for comparison of investigated digital map data only. On the other hand, HERE and TomTom have a higher completeness of telematics-related attributes, particularly the travel direction and the speed category, and hence are more compliant with road safety applications than OSM and ATKIS-Basis-DLM. This work results from the research project Ghosthunter, which has been granted and funded by the German Federal Ministry for Economic Affairs and Energy (BMWi) and the German Aerospace Centre (DLR) under grant number 50 NA 1524. The authors gratefully acknowledge the cooperation of the Institute of Space Technology and Space Applications at the University of the Federal Armed Forces Munich in this project. ADAC (2010): Geisterfahrer – Tipps für den Ernstfall, http://www.adac.de/infotestrat/adac-im-einsatz/motorwelt/geisterfahrer.aspx, last accessed April 2015. ADV (2010): Arbeitsgemeinschaft der Vermessungsverwaltungen der Länder der Bundesrepublik Deutschland (AdV): ATKIS-Objektartenkatalog Basis-DLM 6.0 – BW, Dokumentation zur Modellierung der Geoinformationen des amtlichen Vermessungswesens, 2010. ADV (2008): Arbeitsgemeinschaft der Vermessungsverwaltungen der Länder der Bundesrepublik Deutschland (AdV): Erläuterung zum ATKIS® Basis-DLM. Dokumentation zur Modellierung der Geoinformationen des amtlichen Vermessungswesens, Version 6.0, 2008. BU-WUPPERTAL (2012): Bergische Universität Wuppertal, Bundesanstalt für Straßenwesen: Falschfahrten auf Autobahnen, Schlussbericht, 2012. GOODCHILD, M. F., HUNTER, G. J. (1997): A simple positional accuracy measure for linear features, int. J. Geographical Information Science, Vol.11, No.3, pp. 299–306, 1997. HELBICH, M., AMELUNXEN, C., NEIS, P. (2012): Comparative Spatial Analysis of Positional Accuracy of OpenStreetMap and Proprietary Geodata, Int. GI_Forum, Salzburg, Austria, 2012. HERE (2015): HERE File GeoDatabase Reference Manual v2.6, release date: Chicago, USA, January 1, 2015. NEIS, P., ZIELSTRA, D., ZIPF, A. (2012): The Street Network Evolution of Crowdsourced Maps: OpenStreetMap in Germany 2007–2011, Future Internet, 4, pp. 1–21, 2012. OSM (2016): OpenStreetMap: Attribuierung von Straßen in Deutschland. http://wiki.openstreetmap.org/wiki/Attribuierung_von_Stra%C3%9Fen_in_Deutschland, last accessed January 2016. SCHINDLER, A., MAIER, G., JANDA, F. (2012): Generation of High Precision Digital Maps using Circular Arc Splines, IEEE Intelligent Vehicles Symposium, pp. 246–251, 2012. TOMTOM (2014): TomTom MultiNet® Shapefile, Format Specification 4.7, Doc version 1.2.0, © TomTom Global Content BV and TomTom North America, Inc., 2014. WA2 (2015): WaSoft: GNSS Baseline Processing Engine Wa2. http://www.wasoft.de/e/wa2/index.html, last accessed November 2015. WILTSCHKO, T., KAUFMANN, T. (2005): A Quality Model for Quality Assurance of Road Information, EuroRoadS project, 2005.